I recently spoke with a team of students from Sheridan College about Disco is Dead! which they will be showcasing at LevelUP this year. It looks really unique, and they even built custom controllers to add to the experience. TGD: How many of you are in this team? Have any of you created a game in the past? Team: We are a team of 4th year Bachelor of Game Design students at Sheridan College. Our development team includes Nuha Alkadi, Coulter Baker, Jeffrey Barkun, Kassandra Kadar, Jennifer Johnson and Melissa McQuarrie, with P.J.Tremblay as our composer. Throughout our years of study, we’ve developed and prototyped numerous games and participated in many game jams. 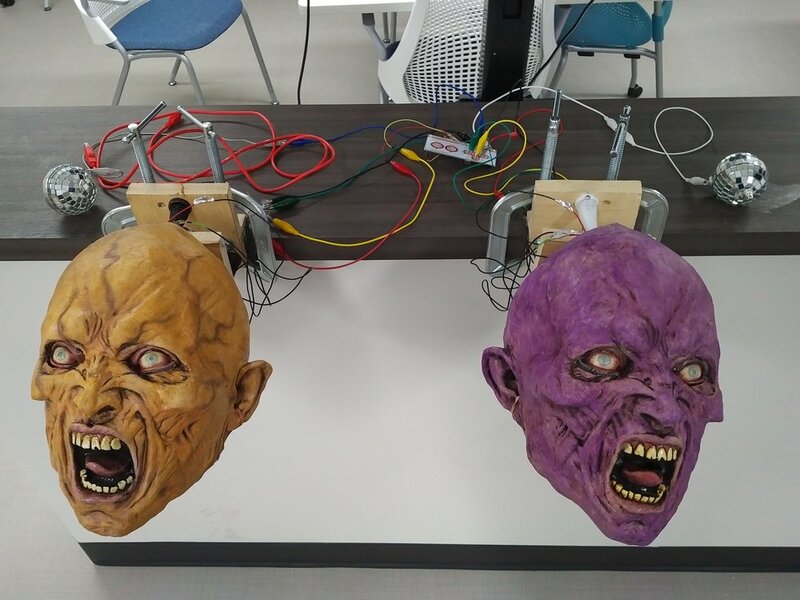 For our capstone year, we took on the challenge of creating an arcade game that plays with custom built alternative controllers titled Disco is Dead! TGD: Tell us more about Disco is Dead! Team: Disco is Dead! is a buddy cop comedy horror co-op arcade game that plays with custom built slappable zombie heads and disco ball controllers. It follows the story of two funky disco-loving cops – Reggie and Kenny – who must save their city from a zombie apocalypse… by slapping! The main gameplay is a fixed runner where players must slap in the indicated directions, and there are interactive comic-book styled cutscenes where slapping can impact the narrative. Team: Additionally, the game allows players to feel like true buddy cops themselves. With cooperative and competitive goals, the two players create off-screen conflict, immersing themselves into enacting the similar behavioural nature of bickering buddy cops. Many players’ favourite moment of the game is activating buddy mode, which requires both players to “grab the (disco) balls and touch (high-five) each other.” Originally, Disco is Dead! was a game jam prototype we created during the summer of 2016. It was designed to be played on arcade cabinets, and the only control was simply slapping the joystick. We decided to take this wacky idea further and create an even more immersive experience. TGD: How long have you been working on it? Team: We have been working on Disco is Dead! for about 8 months now, since September 2016. TGD: Do you plan on working on this game post-level up as well? Team: Disco is Dead! is designed to be a fun and wild experience to play in public places such as arcades and showcases. We are hoping to take our game to as many places as possible to offer players the unique and rare opportunity to slap zombies! Thanks again to the group for taking time for this interview. Really looking forward to playing this at LevelUP TO. Check them out on Twitter at @DiscoIsDeadGame, and their site here.